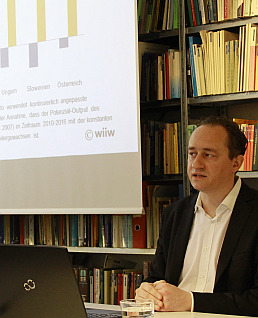 At today’s press conference, Mario Holzner presented the new wiiw forecast for 22 countries of Central, East and Southeast Europe. Here is a summary. The countries of Central, East and Southeast Europe (CESEE) will have a trend growth rate of up to 3% in the period of 2016-2018. This is 1-1½ percentage points higher than average growth in the eurozone. Consumption will be the main growth driver. The Austrian economy is still benefiting from its economic ties with the region. Direct effects of BREXIT on the region will be limited – indirect effects for the European economy as a whole may be considerable. wiiw expects a GDP trend growth rate of up to 3% for CESEE over the medium term. Household consumption will be an important component of economic growth, especially for the EU members of Central and Eastern Europe. There, consumption replaces EU-co-financed investment as the most important growth driver. In the first couple of years of the EU Multiannual Financial Framework payments are usually slow; this should be the same in the new period (2014-2020) and therefore investment is expected to play less of a role. In the countries of the Western Balkans investment and net exports will be important growth drivers. In the Commonwealth of Independent States (CIS) and in Ukraine the economic downturn seems to have bottomed out. After strong economic losses due to the oil price drop, devaluations and war, a period of stagnation will probably follow, before slow growth can be expected to resume. This forecast is based upon an international environment for the CESEE countries that is mainly characterised by weak recovery in the euro area. The rigid EU fiscal rules are the most important obstacle to sustainable economic revival in Europe. There is increasing awareness – at least among economists – that loose monetary policy alone will not lead to a sustainable recovery. Massive EU-wide coordinated public investment is needed to improve the expectations of the economic agents and to generate a reversal of the trend in private investment. The effects of the EU referendum in the UK pose, however, an additional substantial risk for the total EU economy, in particular because of markedly increased economic uncertainty. An immediate downturn in the financial markets has already materialised. Further effects should, however, mostly be felt in the medium term. Therefore these effects are not yet taken account of in our forecast. The longer-term impact of the BREXIT vote on institutional developments, relocations and the EU’s economic policy orientation may, however, be considerable. Some CESEE countries will have to deal with additional, direct economic consequences as a result of the exit of the UK from the EU. Many Poles (790 th. ), Romanians (137 th. ), Lithuanians (137 th.) and Latvians (102 th.) may start to worry about their possibilities to remain in the UK. Important trade relations between CESEE and the UK exist particularly in the case of Belarus, Poland and Turkey. Also the Czech Republic, Latvia and Slovakia all have a share of more than 5% of their exports going to the UK. In general, however, the direct effects are likely to be limited. Moreover, exit negotiations will take at least two years; and if there is a further transition period the impact of BREXIT on the business cycle still remains quite unclear. Austria should gain from the recovery in CESEE, as the region is home to important Austrian trading partners. These pose, however, only a limited danger for Austrian competitiveness. Over the longer term wages in CESEE will be rising faster than productivity. The share of Austrian FDI in the region is declining and also Austrian greenfield investment has recently become cautious. However, Austrian total FDI income has increased to more than 10 bn euro annually.